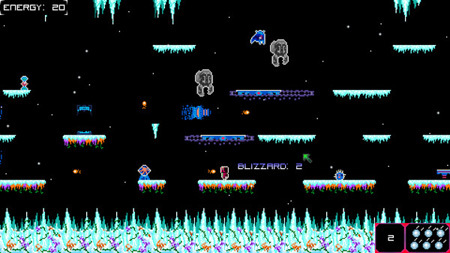 Aliens Are Rude is a fast-paced platforming action game from David Ruttan. Run your way and collect as many spare metals as possible for your ship. The robots were dancing happily away until the aliens came and crashed the party. Engage in space combat, traverse planets, learn abilities from aliens, upgrade with perks and titles, strategize, dodge, shoot, and reclaim the nebulous. Upgrade robot reinforcements with a progression system involving 13 perks and 3 titles. Titles allow unique combinations of perks for further customization. Emphasis on tactics in space combat through the use of scan mode which allows the player to gather info on enemies before engaging them. The game features large variety of strategies through the use of modifiers on enemies that allow the player to scan them and learn their ability, spawn hazards on death, double health points, and much more. If you get stuck in the game, check out the video walkthrough and gameplay for the game. This entry was posted in PC Games, Walkthrough and tagged Aliens Are Rude Cheats, Aliens Are Rude Game, Aliens Are Rude Gameplay, Aliens Are Rude Guide, Aliens Are Rude Hints, Aliens Are Rude Review, Aliens Are Rude Solutions, Aliens Are Rude Strategy, Aliens Are Rude Tips, Aliens Are Rude Walkthrough by Marvin. Bookmark the permalink.